MANHATTAN, Kan. (AP) — The changes that have already taken place at Kansas State under new football coach Chris Klieman are evident from the moment you walk onto the practice field. 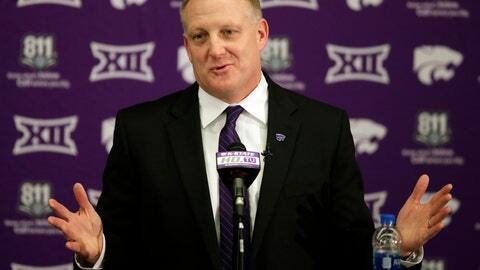 Not every workout this spring has been open, of course, but Klieman’s decision to change things up is a big change after more than two decades of vice-like secrecy under longtime coach Bill Snyder. There is still plenty of discipline and efficiency, but the overall attitude around the program is loose and fresh — more fun, even. “They bring a lot of energy, a new environment,” Wildcats running back Harry Trotter said of the new coaching staff, which was pieced together following Snyder’s retirement in December. None of this is a knock on Snyder, whose Hall of Fame tenure here included what longtime coach Barry Switzer called the greatest turnaround in college football history. Snyder won a pair of Big 12 titles at the once-dormant — or doormat — program, and his success is evident by the fact that the stadium where Klieman now works has been named in his honor. But it also demonstrates how behind-the-times Kansas State had become. The days of insulating a program from the outside world are long gone, thanks largely to social media. No longer can a coach shut down practice to all outsiders or decline to speak to the media or successfully muzzle their players. These days, the most successful coaches actually embrace social media. They rely on videos of practice and meetings and off-the-cuff hijinks to give fans and potential recruits an inside look at the inner workings of a college football program at the highest level. Klieman embraced all of that from the moment he accepted the job. He was filmed by Kansas State’s sports information department on the plane ride from his former school, FCS powerhouse North Dakota State, to his introductory press conference in Manhattan. He’s starred in videos during tours of the state, and he regularly posts photos with recruits who are visiting. It’s the kind of openness that never existed under his predecessor. Another departure comes Saturday, when the new coaching staff jettisons the staid, old spring game in favor of a day-long celebration. The “spring showcase” will be an interactive practice where fans can watch drills, hear from coaches and take part in events on the stadium concourse. Klieman plans to cap the day by providing live, on-field commentary of a 30-minute scrimmage. The focus throughout spring, Klieman said, has been learning personnel, building relationships among the players and staff, and installing the backbone of their new offensive and defensive schemes. Offensive coordinator Courtney Messingham is putting in place a system that should be a marked departure from the rest of the Big 12. Just like at North Dakota State, the Wildcats plan to pound teams on the ground more so than slice them up through the air. Defensive coordinator Scottie Hazelton, who has experience in the NFL and was most recently in charge of the defense at Wyoming, is implementing a versatile, aggressive defensive system. This is all scratching the surface, of course. Most of Kansas State’s recruiting class won’t be on campus for a few more weeks, and there’s still an entire summer of workouts and fall camp before the Wildcats see where they stack up in their opener Aug. 31 against Nicholls State. One thing is certain, though: It should be easier to keep tabs on progress along the way.